Don't I look angelic here? Yep, I do. All I need are my wings. I was a good kittie on Sunday. I didn't do anything to wake mum up early. I let her sleep until she decided to get up. That was around 7:20 AM. She went to bed about 10:30 PM, so she nearly had 9 hours of sleep. She didn't even have to bribe me with some licks of her ice cream. Plus she took a short nap in the afternoon too on Sunday. I had some good naps too on Sunday. I took over the bed while mum was washing the sheets. Me and Mr Bear snuggling on the bed, and I got a longer than usual nap as mum washed the sheets last instead of first! Saturday mum went to have dinner with Miss Lynn. She brought a box home but I don't know what is inside yet. It didn't smell like much to me, no ham, chickhen etc. that I could detect. It got cooler out again, so nice open window season. I love to sit in the windows and watch the birdies and such. When I get all 'acited I chitter and my tail wooshes back and forth. Mum's ear is getting better. She says at times it feels completely normal, then for bits of time it feels a bit wonky yet. Not to worry she will be taking care of any issues that come up so this doesn't go on for a long time. If she needs to see the bean vet again, she will do so to make sure this all gets cleared up. Well I tried to let mum sleep a little later today. She was getting all crabilated with not enough sleep, thanks to me she says, plus with her ear being all wonky and such. So I didn't wake her up until 6 AM instead of 4 AM like the last few mornings. She always wakes up when I jump on the table to check out the little lamp and try to push it over. I don't know why that little bit of noise should wake her up, but it does. 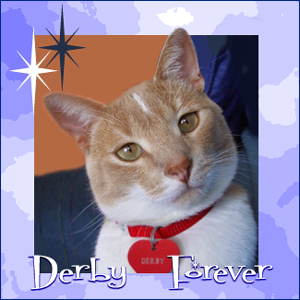 Then she says, "Get down Derby". If I don't jump down immediately, then she gets out of bed, picks me up and takes me back to bed with her. I don't like that! I don't want to be snuggled except when I choose to be snuggled. Mum was nice to me and let me have a few licks on her ice cream thingy. She eats the chocolate off, then lets me have some of the white stuff. Yeah, for that I gave you two extra hours of sleep. Not sure what the weekend program will be here. Probably the usual with the sucking monster, the washy machine going and all. I know what is on my list, lick, rub, repeat. Plus a few naps and all. Hope everyone is having a good weekend. Another Friday and another furiend to say good bye to. 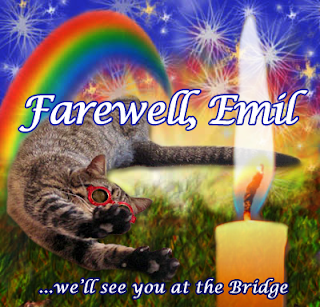 Have fun at the Bridge Emil. Try not to disturb everyone taking pictures. A Pretty pink rose for Emil. Yes guys deserve roses too. I have been on major snuggle duty for the past few days. Mum has gone to work, but then comes home and doesn't want to do much. She went to see her own bean VET today. She gave mum more big pills, but these are PINK. Mum says she will be fine, just that it is like being in an airplane and not getting your ears to pop. Only it is just one ear! Thanks for all your purrs for mum. Gotta go, Dr Derby is needed. Yep we cats are our own moral compass. So don't mess with us or question why we do what we do. Our natural state is to kill birdies, mousies and other stuff for food. So it is our nature to be hunters and stalk. Heck, I even stalk mum sometimes for fun. I teleported off to Gree and Othello's wedding. It was furry lovely and great to be with all of our furiends to celebrate. Mum was gone most of Caturday and then Sunday she wasn't feeling well. She even went to see the bean vet! It didn't take long but he said she had fluid that was all blocked up in one ear. He gave her big pills to take, so she just sort of sat around or we even napped a bit together. That was fine as we had off and on rain showers. The metal monster is back in its room. Mum says it was Ok to drive on the new driveway now, so the monster is safely tucked away at night again. Even though we live in a very safe place she still worries about someone damaging or stealing it! 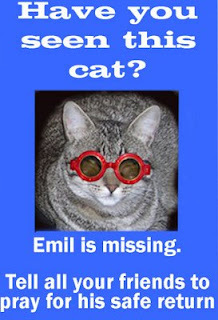 If anyone sees the above cat, Emil of the Cat Realm, tell him to go home! His family is missing him terribly and is furry worried. You can also read more about Emil here. Plus the gang over at Caturday have a new family at the shelter that needs a home. It is a complete family of Gorgeous Gingers. Yep, MomCat, DadCat, and five wonderful little gingers. They called them the Cheddar family. I think they are the Cheeseheads. Go check them out, they are so cute. Wouldn't you just love a whole ready-made ginger family? Yep, you would. Somebody adopt the whole family! Sorry if I scared or had everycat worried that I was missing. Don't worry if that had happened mum would have had an APB out for me all over the blogosphere. Mum come look, the guys with all the big trucks are back! What are they going to take now? I gotta get closer to see this today. You could have opened the window just a little bit more mum. They unloaded all sorts of fancy metal monsters and the big red ones had stinky black hairballs inside, which it yakked up an it went inside the orange monster. That monster then put this stuff down in a nice flat strip where the old driveway was. The guys did this a couple of times to make a big, thick black patty on the area, then the one monster got loaded back on its truck. They watered it, but I don't think it is going to grown like mum's plants when she waters them. And this little monster they moved inside the room and then it went up and down the driveway, mum says that it smooshes it nice and tight. It was fun to watch it go up and down the driveway. Soon it was all over and they left, leaving us to have a quiet rest of the day. Mum says they did a nice job. But she can't actually drive on it for three days. So what was missing is back, but looking so much better. Here is my flower of the week, a poppy. The poppies started to pop during all of our rainy days. So mum couldn't get very good pictures and the flowers were already getting wrecked by the rain. But these are still one of her favorite flowers and she is happy they like to grow here. Happy weekend everyone. I will be taking off to Gree and Othello's wedding on Saturday. See you all there. Mum went to work today ant this is how it looked in front of our house. When mum came home it looked like this. I told her these guys came with big stuff and truck and took away the place where the metal monster has to drive. They stole the driveway! 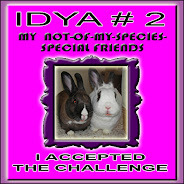 Mum says that is OK, she is paying somebody to do this. What? You had to pay someone to take this stuff away? So the metal monster is not in its room tonight it has to sit outside on the street. Mum says there will be more stuff happening tomorrow. Hmmm, gotta wait to see this. 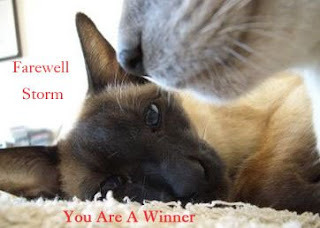 Yep that is a good purrayer for all of us! Mum was busy this past weekend. She raced around the house all Saturday morning doing stuff, like playing with the sucking monster, washing the laundry etc. Look at all my furs she picked up with the sucking monster. Doing all sorts of stuff outside too. With all of the rain we had she had to clean out the birdie feeders. The seeds had started to sprout! So she dumped all of that stuff out and let the feeders dry in the sun. Then put them back with fresh seed for our little birdie furends. She worked on the weeds in the garden too, says they grew furry fast this past week. She took some pictures of the plants, and then put some very tiny plants in this big pot. Do you see what that is, yes my furiends that is catnip. Mum planted some of my very own nip! Grow big little plants. Then she went out and grilled her chickhen outside at lunch time, then she ate it outside too. I didn't get any! But then mum got out my porch and took me outside! What fun! I got to visit with Virginger and PHE, who are guarding the catnip plants. We saw a hummer come to the feeder near us to feed, birdies and squirrels coming in and out of the yard. Alert, a dove just landed! I gotta wait and see if it comes closer. Even outside I gotta keep my nice white paws clean. I could do that when I wasn't on alert for birdies. Plus we were just sitting outside so nicely, sunny, warm not humid. Mum little weather radio starts going off! We had more bad storms coming! Thankfully they were brief and didn't leave much wet stuff, but really, we don't need any more wet stuff from the sky. I took off and went to Gree & Othello's wedding shower in San Francisco. We had a good time in the City by the Bay. I even won a shower game, guessing three of Gree's favorite things. But with our wrong funny answers we came up with a new drink, Blue Tuna Gizzy - blue coolaid, tuna juice and champagne! You can even freeze it and eat it with a spoon. I think for short we will just call it a BT Gizzy. After I got home there was a report on the news that two cable cars hit each other. Hmmm, Victor was being crazy driving a cable car, I hope it wasn't him. At least they did NOT report cats running away from the scene. Sunday mum took Grampie out to eat for Father's Day, then they came home and messed about in the back yard for a bit. Mum got all dirty as usual. Hope everyone had a wonderful Dad's Day to all to whom it applies. Mum, the big plastic thingy that holds my food, it is all air and no food. Does this means that I have to go on a diet? Mum you have never let me down with giving me foods, you better not blow it this time. Ah, this is much better. Crunchies, crunchies and more crunchies. I shouldn't have worried, she had a new bag outside in the metal monster just waiting to fill this up. I know mum I should have more faith in you, you haven't let me down on the food thing yet. A wonderful white pea-o-knee for Storm. Opus and Rosco lost their bus. 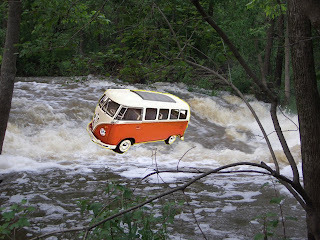 I think it got caught up in the rain storms here and is now floating down the river! 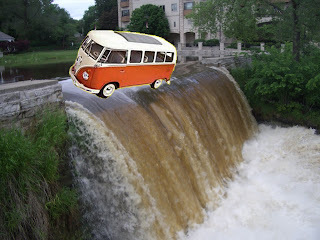 That has to be a rough ride! Yes we have had lots of water. Thankfully it has calmed down some since Sunday evening when we got more heavy rain. Mum checked the water measure thingy again and with the previous stuff we got 6.5 inches of rain from Saturday at 4 PM to 8 AM on Monday. Now we have a waterfall in our town, very pretty and I have shown you pictures of this before, but here they are again. Just to show you how nice it can look. This is about a mile east of our house. This is what it looks like on Monday evening. Mum says she wishes she had a moovy camera with sound and all to really show you how much water is going swoosh down the river. No Kidding there is danger! But this sign is there all the time as you know some crazy person would be out there and fall down the falls. This is looking away from the falls doing downstream and under the bridge. Mum drives over this bridge every day to get to and from work. The view from the other side of the bridge. Those trees normally would not have water on both sides of them. Even farther down stream, mum could stand right by the side of where the water had come too. Don't worry she was safe to stand there. Thankfully the house is dry inside, even if the lawn is soggy. The places where mum has to drive the streets are open and not closed because of floods. But mum came home from working on Monday and went out and climbed up the ladder to clear out all of this muck from the rain gutters. They weren't draining like they should, so she had to climb up the ladder and toss the stuff down. How many hundreds of maple seeds do you want? Me, snoopervising as usual. Mum did a good job and didn't get too dirty, usually she gets really dirty when she works outside. Plus she was good and didn't fall off the ladder. I don't know how to dial 911 for her, so she better be careful. Hope all of my kittie furiends who had bad weather over the weekend are OK. I wasn't doing much stretching at times this past weekend on Saturday. I spent extra time inside the PTU as mum decided had to just sit in the dungeon for a while. She had radios on that kept saying, 'take cover'. So we did. Here I am just sitting in the PTU watching mum sit on the steps to the dungeon. Just waiting for the time to go by until it was safe to go back upstairs. She brought a few things down with her that would be important besides me. Her 'puter, the money bag and her camera. She also had her emergency weather radio, a regular radio and a flash light. We spent about 45 minutes waiting and mum said I was a good kittie the whole time. I didn't get restless or talk very much. I guess I understood that we had to be down there to be safe. Plus with all of the bad weather we didn't get to see the horsie race live. That was about the time the weather beans were on the TV were talking, for a long time about the furry bad weather. Finally we could go upstairs and I could get a chance to stretch some. That and listen to the rain and the boomers. I kept thinking of Bonnie and all the other kitties at The Bridge playing Thundering Herd of Elephants. Hope every kittie if they had storms are OK. We are sort of soggy around here as you can see from the picture mum took of the water measuring thingy. Nearly 5 inches of rain between late Saturday afternoon and around 1 PM Sunday. When it rains this much in then the lakes across the trail show up. That actually might be fun for a little wafer to play in. Swing and splash around in the big puddle. Mum says she is tired of the wet stuff. First a winter with so much snow, now a spring with lots of rain. Enough already!!!! Plus I can hear Bonnie and company doing THoE again!